Audi AG is able to look back on an exciting and varied past – its tradition of automotive and engine manufacturing extends back into the 19th century. It all began with the activities of August Horch, one of Germany's pioneering personalities of automotive construction. After graduating from the Technical University of Mittweida, Saxony, Horch took his first job at Carl Benz, in Mannheim, initially working in the Engine Manufacturing Department and then becoming Head of the Motor Vehicle Construction Department. 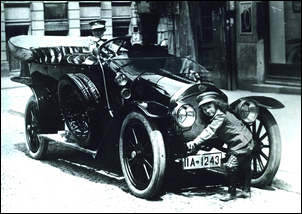 He set up business on his own in 1899, establishing Horch & Cie. Motorwagen Werke in Cologne on November 14 of that year. Horch moved to Saxony in 1902, first to Reichenbach and then to Zwickau in 1904, where the company was transformed into a stock corporation. Following a difference of opinion with the Board of Management and Supervisory Board, August Horch left the company in 1909 but immediately established a second car company in Zwickau. Because his surname was already in use and was protected by trademark, he chose its Latin translation for the name of the new company. So "horch!" – or "hark" – became "audi!". The idea of using the Latin imperative form was supplied by the son of one of August Horch's business partners; the boy, well-versed in Latin, had overheard the discussion about the quest for a new company name. In subsequent correspondence with him, August Horch even signed his letters with the words "Kind Regards – Audi-Horch". Audi Automobilwerke GmbH itself became a stock corporation in December 1914. The Audi brand established a tradition of sporting accomplishments at the very outset. Thanks to his victorious involvement in the Austrian Alpine Run between 1911 and 1914, August Horch succeeded in making Audi a household name internationally within the space of just a few years. The notably successful Audi Type C 14/35 hp even acquired the nickname "Alpine Conqueror". After the First World War, August Horch withdrew from the company and moved to Berlin to work as an independent automotive expert. In 1921 Audiwerke AG took the motoring world by surprise by unveiling the new Audi 14/50 hp Type K, Germany's first left-hand-drive car. In making this move, Audi spread its net beyond merely engine and suspension technology and began to channel more energy into the areas of driving safety and ease of operation. 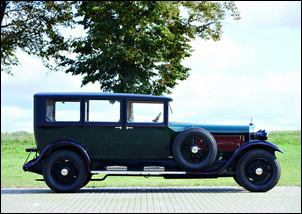 The Type M, with a six-cylinder engine, followed in 1923 and the first eight-cylinder Audi model, the Audi Imperator, appeared in 1927. In August 1928 Jörgen Skafte Rasmussen, owner of Zschopauer Motorenwerke/DKW, acquired a majority interest in Audiwerke AG, the following year merging the Zwickau-based company with his own business empire. When the global economy plunged into crisis in October 1929, sales of large car models with six and eight-cylinder engines collapsed. 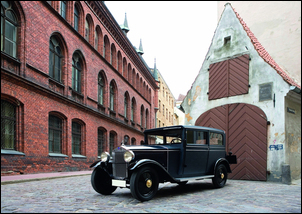 Rasmussen responded by commissioning Audi to develop a small DKW car with front-wheel drive, and this model was launched highly successfully in 1931. The Audi plant also assembled DKW Front models, in a measure designed to protect jobs. At the behest of the State Bank of Saxony, which realised that its investment in Saxony's car industry was in peril, Audiwerke, Horchwerke and Zschopauer Motorenwerke/DKW merged to form Auto Union AG on June 29, 1932. The new entity simultaneously concluded an agreement with Wanderer Werke on the purchase and lease of Wanderer's automotive division. The new group chose Chemnitz for its registered office. The symbol of this merger was four rings, the design that serves as the Audi logo to this very day. Following its creation, Auto Union AG was the second-largest motor vehicle group in Germany. The brand names Audi, DKW, Horch and Wanderer were retained. Each of the four brands within the group was assigned a specific market segment: DKW for motorcycles and small cars, Wanderer for midsize cars, Audi for cars in the deluxe midsize segment, and Horch for luxury cars at the top end of the market. To raise its public profile, in 1934 the new company decided to get involved in motor racing at the very highest level – Grand Prix – and over the next few years saw its Auto Union "Silver Arrow" models clinch countless races, championships and world records on racetracks around the world. One of the keys to the success of the still young Auto Union was the allocation of a specific market segment to each of the individual brands in order to create a coordinated model range. Specifically for the Audi brand, this prompted the development of the Audi Front Type UW, a midsize car through which the new group was for the first time able to make use of synergy benefits. The principal feature of the new Audi was its front-wheel drive. DKW's experience in the domain of front-wheel drive had simply been translated into a midsize vehicle. Its power unit was a Wanderer 2-litre, six-cylinder engine developed by Ferdinand Porsche, the body of the saloon version came from Horch's body shop, and the Cabriolets were built by the renowned Dresden coachbuilder Gläser. 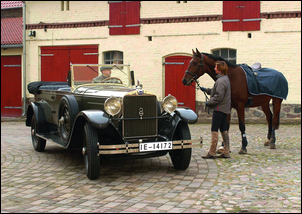 The Audi Front Type UW – the designation means a Type U with Wanderer engine – went into production in the early part of 1933. One year later, Audi's production operations were transferred to the nearby Horch plant in order to free up capacity at the Audi plant for the rising production output of DKW Front models. With technically revised features and equipped with a tuned-up 2.3-litre Wanderer engine, the new Audi Front 225 (the title pic of this article) was unveiled at the 1935 Berlin Motor Show and remained on the market until 1938. The successor model, the Audi 920, likewise exhibited the hallmark features of a modular system. 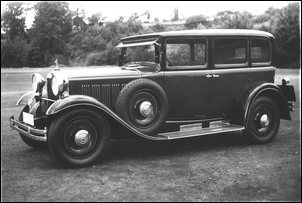 The chassis, which had now reverted to conventional rear-wheel drive, and the modern-styled body were largely borrowed from the six-cylinder Wanderer W 23 model. This elegant car had a straight-six OHC engine developed by Horch, while the rear axle adopted the DKW floating-axle principle. The first specimens of the new car left the production line at Auto Union's Horch plant in December 1938. The Audi 920 rapidly became a hit with customers. This success was brought to an abrupt halt with the outbreak of the Second World War. Production of civilian vehicles was slashed and the group's operations switched to the production of armaments. 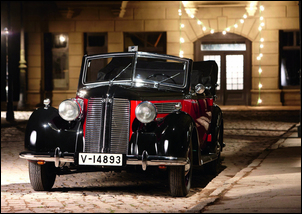 The last Audi of this era was completed in April 1940. There would not be another for a quarter of a century. In 1945, after the war had ended, Auto Union AG's premises were located in the zone occupied by the Soviet forces, who expropriated its assets and dismantled the plant; the company was removed from the Commercial Register of the city of Chemnitz in 1948. Certain members of Auto Union's senior management had already moved to Bavaria at the end of the war, and in late 1945 a depot for Auto Union parts was set up in the historic garrison city of Ingolstadt. These tentative efforts to relaunch operations led to the founding of a new company named Auto Union GmbH on September 3, 1949, with the purpose of upholding the automotive tradition of the four rings. The first products with the four-ring badge built in this era were well-established DKW models with two-stroke engines. These basic but robust and reliable cars and motorcycles were just right for the austere circumstances of the post-war years. The DKW F 89 L rapid delivery van and the DKW RT 125 W motorcycle were unveiled at the Hanover Export Fair in early 1949. These models established automotive manufacturing in Ingolstadt. In parallel, the company was working on a DKW car, which went into production at a new plant in Düsseldorf in summer 1950. From 1954 onwards, Friedrich Flick gradually acquired a large stake in the equity of Auto Union GmbH. His strategy was to find a strong partner for Auto Union in the medium term. In April 1958, Daimler-Benz AG acquired 88 percent of Auto Union's shares and in the following year the Ingolstadt company became a fully-owned subsidiary. In persisting with two-stroke engines, the company saw sales of DKW models gradually dwindle throughout the early 1960s. Daimler-Benz responded to the situation by commissioning the engineer Ludwig Kraus, its appointed Technical Director in Ingolstadt, to adapt Daimler's own four-cylinder, four-stroke engine for use in the new DKW F 102 model. This new Auto Union model appeared on the market in 1965, the brand's first post-war car with a four-stroke engine. Along with this dawning of a new era, it was felt that the time was ripe for a new product designation. It thus came about that the traditional name Audi was resurrected. The Auto Union "Audi Type", which initially carried no further model designation, was widely advertised and became a resounding success. This car line remained in production until 1972, undergoing a few technical and optical modifications along the way. But a new era had dawned in Ingolstadt in another sense, too, because the company had become part of the Volkswagen Group in 1965. The new bosses forbade Ingolstadt's engineers from developing models of their own. Their grand plan was to use Ingolstadt's production capacity for building the VW Beetle. But they had reckoned without Ludwig Kraus, at that time Head of Development and member of the Board of Management, who decided to proceed with the development of a new Audi model on the quiet. The resulting model, which the group management in Wolfsburg ultimately sanctioned, was first presented to the international press in Ingolstadt in November 1968. Its name: Audi 100. 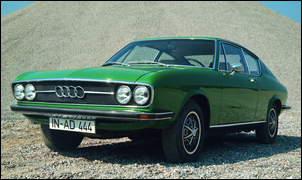 The Audi 100 was the first vehicle to have shaken off all genetic links with the former DKW models. The huge success of this new Audi proved its creators right. 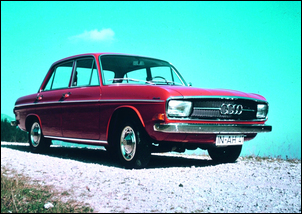 The Audi 100 also helped Auto Union to preserve its separate identity. In 1969 Volkswagenwerk AG engineered the merger of Auto Union GmbH and the Neckarsulm-based NSU Motorenwerke AG. The new company now became known as Audi NSU Auto Union AG and had its registered office in Neckarsulm. The extensive range of Audi and NSU models covering a wide variety of engines and drive concepts prompted the coining of a new advertising slogan in 1971, and one that has effectively been the company's mission statement ever since: "Vorsprung durch Technik". 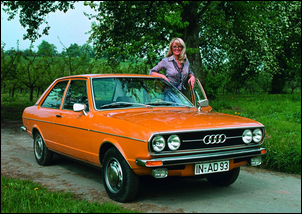 It was in this spirit that the first-generation Audi 80 (B1 series) was launched in 1972, with a glittering array of new technical features such as an OHC engine series and self-stabilising steering negative scrub radius. By the time production of this first generation ceased, over one million units had been built. 1974 saw the appointment of Ferdinand Piëch as Ludwig Kraus' successor, initially as Head of Technical Development. 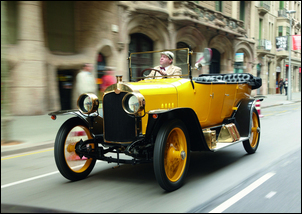 Over the "Piëch era" Audi was transformed into a highly innovative car manufacturer. This period also witnessed the gradual raising of the Audi brand's positioning. The five-cylinder engine (1976), turbocharger technology (1979) and quattro four-wheel drive (1980) are testimonies to the success of this drive. The company underwent a change of name from Audi NSU Auto Union AG to AUDI AG in 1985. Since then, the company and the products it builds have shared the same name. The company's headquarters were moved back to Ingolstadt. Audi's subsequent progress has witnessed a range of technical innovations: fully galvanised bodies, the most aerodynamic volume-built saloon of its time, the broad-based use of petrol engines with exhaust turbocharging, the development of economical direct-injection diesel engines, the aluminium body, petrol direct injection and the manufacture of luxury-class cars with eight and twelve-cylinder engines.